Lock in a great price for Rydges Esplanade Resort Cairns – rated 8.2 by recent guests! The location, the cleanliness, undercover parking, the view of the oean from our room. I loved this hotel. The location was excellent, I got upgraded to a sea view room which was fantastic. The bed was super comfy, friendly staff, nice food. No complaints. I would stay here again. The breakfast has a lot of choices. The view of the ocean. The floors with the rooms are quiet. Just great staff, not too far from centre of town, bed comfy and a great breakfast. Good gym as well..
Lovely Breakfast Buffet. Nice self laundry facilities on e different floors. The staff were really nice. We mentioned to them that we got engaged and they surprised us with a complementary bottle of sparkling wine in our room! The view from our room was amazing. Breakfast buffet was really good with a lot of options and an omelette station where you could order your own customized egg or omelette. Comfortable bed and good location. Having a balcony was great. Spacious room good service nice pool lovely view beautiful walk along the boardwalk to the city centre. The pool area was great very relaxing plenty of sun loungers , staff very friendly & helpful , room was very clean, tidy & very spacious. Bed was comfy. Easy walk into town. Our room had a beautiful view. Staff was very friendly. Rydges Esplanade Resort Cairns This rating is a reflection of how the property compares to the industry standard when it comes to price, facilities and services available. It's based on a self-evaluation by the property. Use this rating to help choose your stay! Overlooking the Coral Sea, Rydges Esplanade has rooms with a private balcony and city, mountain or ocean views. It features 3 swimming pools, a children's pool, 2 tennis courts and an award-winning restaurant. Surrounded by beautiful tropical gardens, Rydges Cairns Resort has a fully-equipped fitness center with a spa, a sauna and massage services. Free WiFi is available in hotel-style rooms and all public areas. Rydges Esplanade's rooms are air-conditioned and feature contemporary décor. Each has satellite TV, a minibar and tea/coffee-making supplies. Free Wi-Fi, a hairdryer and ironing facilities are provided in all rooms. Coral Hedge Brasserie serves a sumptuous full buffet breakfast and all day dining snack menu. In the evening, the Fire & Ice Seafood Dinner has a selection of fresh meats, poultry and seafood flame grilled to your order. Rydges Esplanade Resort Cairns is on The Esplanade, a 15-minute walk from the Cairns lagoon precinct. 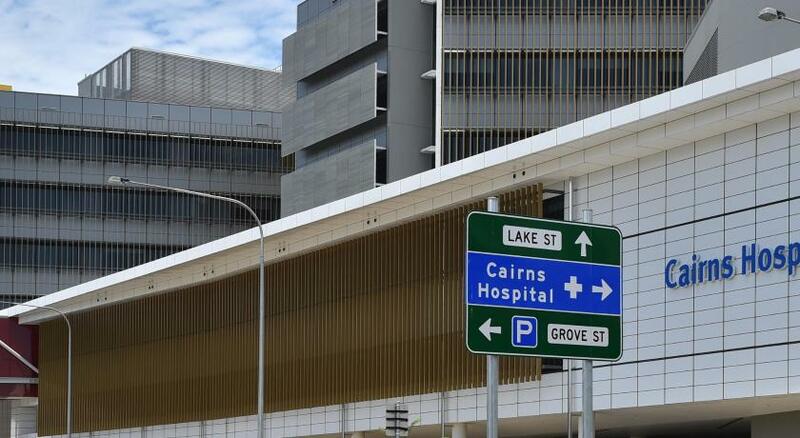 Cairns International Airport is a 10-minute drive away. This is our guests' favorite part of Cairns, according to independent reviews. 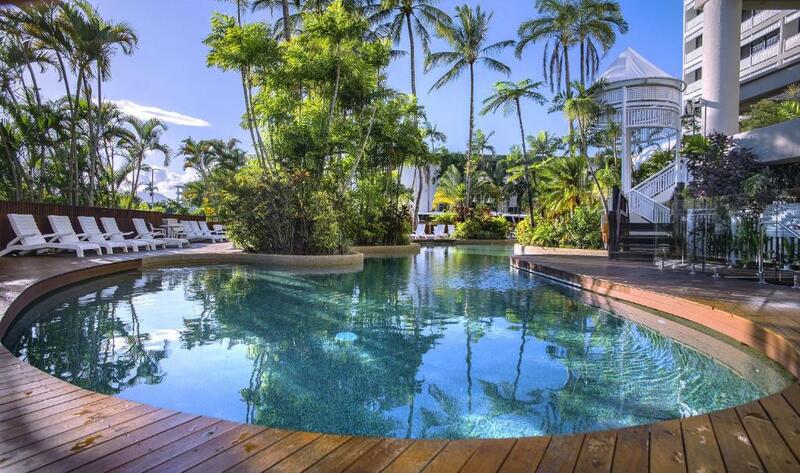 When would you like to stay at Rydges Esplanade Resort Cairns? This room features a private balcony with garden views. Please note that the price is based on 2 guests. Maximum occupancy is 3 adults or 2 adults and 2 children under 12 (see Hotel Policies). Public parking is available on site (reservation is not possible) and costs AUD 10 per day. This room features a private balcony with stunning rainforest and mountain views. Please note that the rate is based on 2 guests. Maximum occupancy is 3 adults or 2 adults and 2 children under 12 (see Hotel Policies). This room features a private balcony overlooking the Coral Sea and Cairns Esplanade. This room features a private balcony and for families. A gaming console is provided for each bunk bed. Please note that the price is based on 4 guests, being 2 adults and 2 children under 12 years old. There is no capacity for additional guests. This apartment features a balcony providing garden views, a kitchenette and an open-plan living area. This room includes a bathroom with both a bath and a shower as well as slippers, bathrobes and free toiletries. It also includes a flat-screen TV with cable, satellite and pay-per-view channels. Air-conditioning, a seating area and ironing facilities are provided. A resort style hotel located in the heart of Cairns situated mid-way along its city’s picturesque esplanade with uninterrupted views of the Coral Sea. As a stepping off point for visitors to the Great Barrier Reef, World Heritage listed rainforest or any other number of regional attractions, this hotel provides guests with a comfortable and convenient base with the luxury of a tropical resort. House Rules Rydges Esplanade Resort Cairns takes special requests – add in the next step! One older child or adult is charged AUD 50 per person per night in an extra bed. Rydges Esplanade Resort Cairns accepts these cards and reserves the right to temporarily hold an amount prior to arrival. Please note that there is a 3.5% charge when you pay with American Express, Diners Club or JCB/Maestro credit cards, and a 1.5% charge when you pay with with Visa or MasterCard credit cards. Free Wi-Fi is not available in apartments. The bed was extra comfy. Stayed in the family/kids room and was amazing for kids to have their own space. Staff were so helpful with any requests. Felt comfortable to approach them about anything. And they interacted with the kids which was lovely. Always room for some improvements. The bed was very comfortable.The shower was good,lots of hot water. Friendly staff with easy check in . Clean , quiet and comfortable room. Location was perfect for our purpose. Nice to be close to the Esplanade for walking. Great breakfast and top view from our room. Staff were great and we love staying there. Very handy for us as we can walk everywhere. Great staff and is an awesome hotel. Spar and Gym area ar a bit dated but okay. I waited for 5 minutes at thecrestaurant entrance for someone to show me to a table, staff kept walking past and motioning they would be with me shortly, it was around 5 minutes before someone actually assisted me to a table, not really acceptable. Mould in the bathroom/shower. Had to pay for parking, not impressed. Toiletries where horrible and cheap. Nothing in the mini bar fridge. No biscuits with the tea. Tea not replenished. Beds are comfy. Big room. The omelette was the best I’ve ever had. Loved the over friendly staff, the location it was, and available to many close by fascilities. Staff attitude - prefer to tell you why they cannot help rather than try help first. The gym was horrible. It is big but equipment dated and grubby looking. Didn’t want to touch anything.